The U.S. trade deficit narrowed in December but for 2016 grew to the widest gap since 2012. The Bureau of Economic Analysis reported that the December deficit shrank by 3.1% because exports increased at a faster pace than imports, suggesting a stirring in the sluggish global economy. For the year, though, the trade deficit grew as the strong dollar and slowdown in China continued to make exports more expensive and imports more attractive to American consumers. American employers had 5.5 million job openings in December, down slightly from November but still near record heights. The number of new hires remained at 3.5 million, according to the Bureau of Labor Statistics. 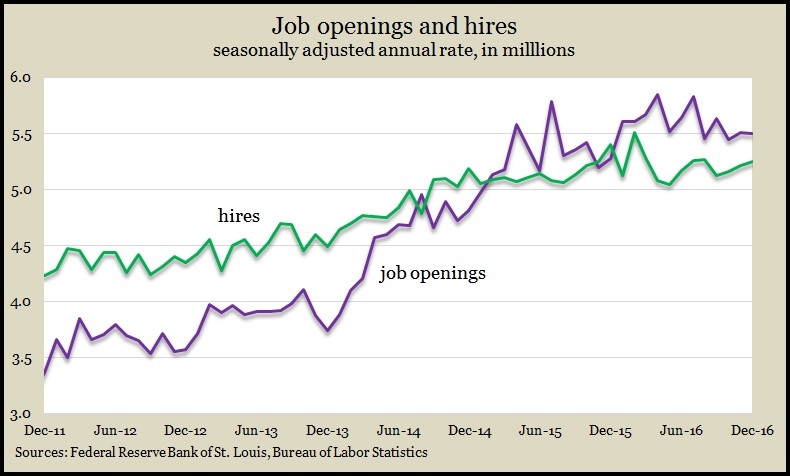 Openings have outnumbered hires for much of the past two years, suggesting the supply of job seekers hasn’t been fully meeting employer demand. That could result in higher pay in some cases, which would fuel consumer spending, the main driver of U.S. economic growth. Student loans and car financing continued to increase the amount of outstanding consumer credit carried by American consumers in December. The pace of debt growth declined from an extraordinarily strong gain in November, according to the Federal Reserve. Revolving credit, which represents credit card borrowing, an indication of consumer spending, fell to an annual rate of 2.9% growth from 14.4% in November. 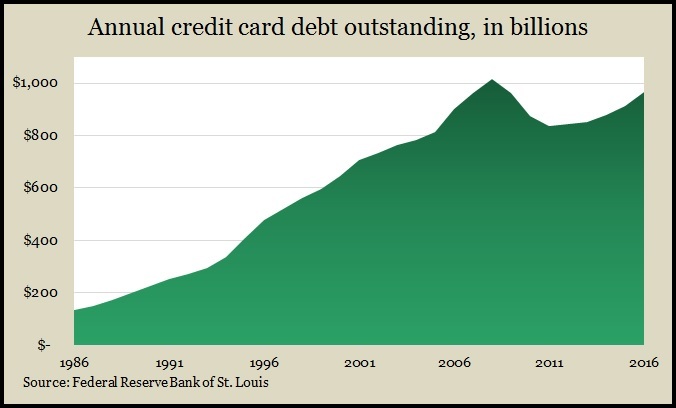 For all of 2016, credit card debt outstanding increased 6% to the highest level since the peak in 2008. The moving four-week average for initial unemployment claims fell for the sixth time in seven weeks, dropping to the lowest level in 43 years. 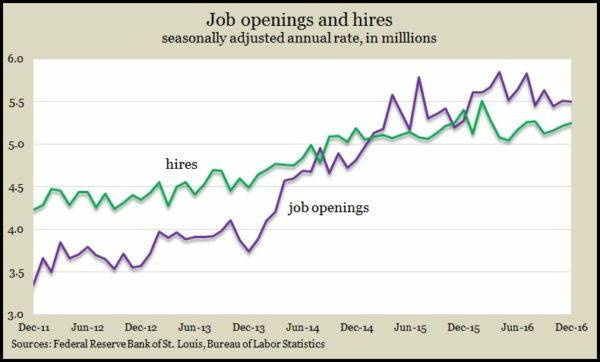 Labor Department data showed further evidence of an encouraging employment market in which employers are reluctant to let go of their workers. Claims are 32% below the all-time average, which dates back to 1967. Wholesalers continued adjusting supply levels to customer demands in December. The Commerce Department said wholesale inventories rose 1% for month, lagging a 2.6% gain in sales, which dropped the inventories-to-sales ratio for the fourth time in five months and the lowest point since the beginning of 2014. The lower ratio indicates a more nimble leanness among wholesalers, although it’s still about as high as it was in the recession. A preliminary survey shows a big drop in consumer sentiment for February after a 10-year high the month before. The University of Michigan index still registered the sixth-highest level of confidence since the recession, which suggests continued gains in consumer spending. The survey registered an all-time high in the mention of government policies as an influence on consumers’ outlooks, about evenly split between those saying they approve of the new administration in Washington and those who disapprove.